We took the kestrel to test fly her and she was perfect. I think she was trying to tell us something with those escapes. The truth is we were amazed that she was alive after her harrowing experience. A short forty-eight hours earlier she was rushed to REGI by a concerned horse owner that found her floating in a horse watering trough. The woman was upset as she always places a board in standing water including that horse watering tank in event birds accidentally get in the water. Without a means to get out of the water birds inevitably drown. The kestrel was an adult and likely has a family at home. We hoped she would recover quickly so she could go home but this recovery was quicker than we anticipated. We did the best thing and after test flying her, doing a quick exit physical and giving her a full crop of meat so she would not have to worry about getting herself dinner tonight she was released. Intern Natasha did the honors of letting her go. 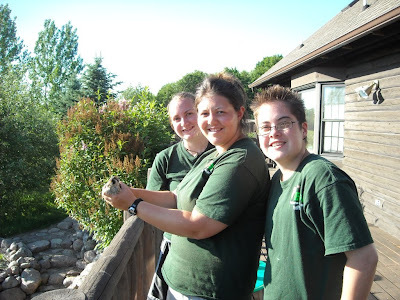 It is always exciting to release birds but even better when they have such a short rehabilitation period. Several birds and a variety of species have come in this past few days. A few of the cases were really odd. Sometimes we tease here that our name should be "Odd R US". 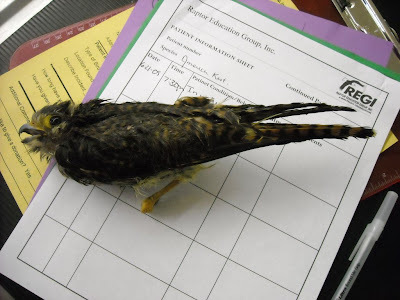 Lynn Ott, longtime REGI volunteer transporter and member of the Wausau Bird Club called with an true emergency case. A baby American Robin had gotten into a pail of motor oil and had been there for about thirty minutes. Heavy oil is toxic and can absorb through the skin. If not removed quickly the bird will not survive. There was no time to transport the tyke instead something had to be done immediately while Lynn had it in her care. Wausau is about a 45 minute drive from the REGI facility. Lynn rose to the occasion and and followed the procedure to clean oil from birds. Of interest the best thing we have found is Dawn Dish washing Soap. It is gentle to birds delicate skin and yet gets rid of the grease quickly. After washing the little one Lynn drove him over to REGI. 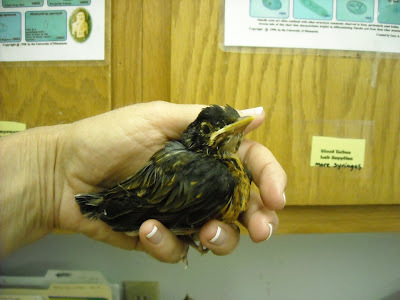 Our clinic smelled like motor oil, but to our amazement the baby American Robin was alive this morning and was hungry. We love those happy cases. Much thank to Lynn for always going the extra mile for us and the birds that are out patients. Our Red-breasted Nuthatch'ss are nearing release into the aviary from their baby screen porch. One of the little ones escaped yesterday and was flying around the compound. Early this morning he showed up near his siblings enclosure and was hoping to be fed. They are self-feeding, but when stressed they revert just like any kid would. He is back with us and his sibling until he gains confidence in eating and finding food in the wild. As I write this it is after 11 P.M. and I am sitting in my car in the parking lot of a local grocery store. So in other words it is a normal night for me and the night is still young so much more can happen. I am here because a woman called me about 10:30 PM with an injured baby bird she had picked up in the middle of the road some thirty miles from the REGI facility. She was worried the little one would not make it through the night. So many people would not make that drive particularly at night, so I agreed to meet her and make her trip a few miles less. The caller was right about the baby. 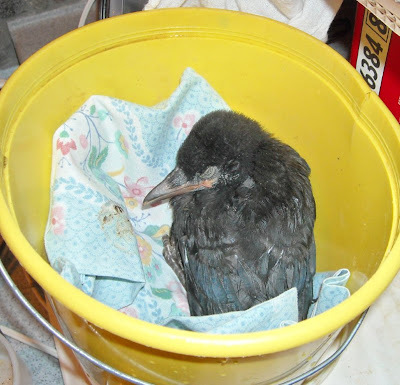 It is a tiny American Crow and likely fell from his nest and is also thin. Something may well have happened to its parents or a predator could have taken him from his nest and dropped him. He is at REGI now. He has had a physical, been fed and is on heat for the night. He is sleeping and after his unfortunate adventure he needs the sleep. We will investigate what appears to be a fracture of the left wing in the morning after he stabilizes. I will sign off now and get back to work. Until tomorrow. Hi, Marge. 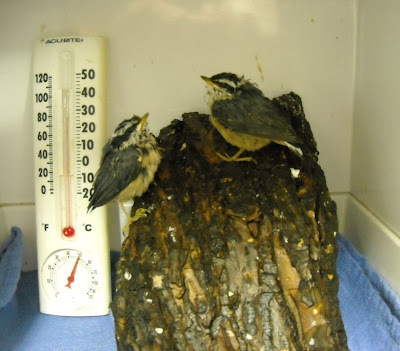 Did the baby birds found in the parking ramp yesterday in Wausau make it through the night? My co-workers and I were pulling for them.